Some of us may be a bit lost when we think of meditation for depression. We may ask, does it really work? How often do I do it for? What does it do anyway? What’s the point? The reason meditation works for depression self help, is because you are more able to control your mind, your emotional arousals, mindfulness, thoughts, self talk, and your alpha state of mind. NOTE: Meditation for depression alone will not take you out of depression, but is yet a depression self help step to end depression. This might sound strange but I accidentally learned the powers of meditation while learning French. I once used a powerful alternative studying technique to learn French. The technique involved a type of meditation to get to the alpha state of mind. When in this alpha state, creativity flows, and I was able to learn much faster, and stay focused much longer on tasks. There are more steps necessary to learn french or any other subject faster than you ever imagined. However, with the basics in this learning method of breathing deeply and relaxing I accidentally found that I was able to control my depression as well. So I created my own meditation technique to exercise my mind and ultimately helped me end depression. Think about it. Depressed people often feel overwhelmed by problems and worries. They want to get away from troubling thoughts, and the heavy burden that life sometimes brings. Being unconscious and sleeping takes us away from the life that creates problems. That’s one reason depressed people are sleepy so often. It’s their mechanism to be unconscious and get away from it all. We are often, however, not tired enough to escape to our sleep, and we’re stuck with being conscious and having to put up with life. So there's a case for using meditation for depression and be unconscious, or semiconscious, as a nice and healthy alternative to clear your mind from problems. I am not advising to escape problems. On the contrary, clearing the mind through meditation for depression, gives us a renewed and stronger ability to deal with our problems. We take away the overwhelming feeling, so we can better manage the problems we do have, but in a more organized matter. We take control, rather than the problems control us. Meditation for depression solves depression issues. Sleeping too often does not, neither does it solve depression fatigue. Meditation and conscious thinking while in the alpha state of mind does help self control and mindfulness. The second argument for meditation is restfulness. When you sit comfortably and meditate the body and mind often feel much more rested than what even a nap can provide. What Is Alpha State Of Mind? The brain naturally produces frequency waves. These brain waves can be measured by electroencelograph machines and range from the beta brainwaves, the fastest of the four different brainwaves to alpha, theta and delta. Delta brainwaves are of the greatest amplitude and slowest frequency. Deep dreamless sleep takes you down to the lowest frequency. Alpha brainwaves frequency ranges from 8 to 14 cycles per second and are associated with the brain's relaxed or neutral state. This occurs when we are relaxed and not under stress. Allowing our minds to go into alpha brainwaves we gain unimaginable energy and thoughts that go beyond ourselves as our mind relaxes, enhances and opens our intuition. Health benefits are gained from meditation for depression, as blood pressure can drop, heart rates slow and the mind becomes calmed and you even become smarter. 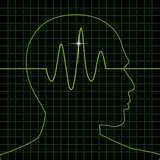 Beta brainwaves are produced when the brain is aroused and engaged in mental activity. The frequency ranges from 14 to 21 cycles per second. This stage is associated with normal, waking, eyes-open consciousness; alertness, arousal, concentration, cognition. Examples are when a person may be doing work, giving a speech, or teaching. Theta brainwaves are present when calmness and relaxation deepen into drowsiness, and ranges from 4 to 7 cycles per second. The brain shifts to this twilight state of drowsiness, meditative and light sleep. Theta is associated with vivid imagery, creative insights, dreaming, visions, and creative ideas. Delta Waves, 4 cycles per second, are typically associated with deep sleep or unconsciousness. Delta is also generated by those who can access deep trancelike or 'non-physical' states. We use meditation for depression to develop the ability to shift from one mental state to another. In our case we want to get to an alpha and even a theta state of mind. We rest our minds, while our bodies are completely relaxed. There is an infinite number of guided meditations you can read or listen to that will take you to the alpha state of mind. Depressed people tend to have high levels of emotional arousal. So we are mostly going to use meditation to get to the alpha state of mind. Go to the alpha state often, and stay for long periods of time. Use the time for creative work. Write E-mails, do some brainstorming. Do your analytical work. There’s guided meditation that can help you get there. I personally like using specialized 60 cycle music that keeps me in alpha state while I work. But the music is not necessary. To get to the alpha level you need to first have a relaxation and meditation session. Music can help you continue on the alpha brainwave for longer periods. Here’s a sample guided meditation for depression. You can do this and many other variations found on the web, or just make one of your own. Bring your attention to your breathing. Notice if it’s shallow breathing, or short and quick breaths. Close your eyes and take a deep breath to a count of four and fill your belly. Allow your belly, rather than your chest, to expand and contract with each deep breath. Exhale fully and slowly contract your belly. NOTE: If any thoughts interrupt you, just bring your attention back to your breathing. Mind interruptions are normal, so do not fret. Just keep the exercise going. Repeat four times deep breaths to a count of four and exhale to a count of four. Now take a 4 count deep breath. Hold it for a count of four. And exhale for a count of four. Repeat four times the pattern of deep breath, holding, and exhale to a count of four each. Now take yourself somewhere where you feel most relaxed. A beach in the summer, or the mountains. I like to imagine going to the mountains on a beautiful setting near a running brook. I imagine the sound of the brook, and birds chirping softly nearby. You sit and watch the beautiful scene. Feel the soft grass under you, hear the soothing sound of the running water, and smell the fresh breath of mountain air. This is your safe place and sanctuary, and you can come back to this place any time you need to. It is here for you to enjoy. Give yourself self affirmations such as: I am calm and collected. I love to do my tasks in a calm and relaxed manner. I am good at staying calm and relaxed and keeping things in perspective. NOTE: Self affirmations are a great way to bring purpose to your meditation. Meditation connects your conscious with your unconscious, and self affirmations in a meditative state helps communicate and connect the conscious desires into the deeper unconscious self. Open your eyes and continue with your day. Repeating meditation for depression once a day is good. Twice a day is great, and three times a day is excellent. The more you use meditation for depression, the more you’ll exercise your mind to help it be in self control. The self affirmations during the meditative is an excellent tool to communicate with your unconscious and tell it the positive things you want in life. Let your unconscious self do the rest of the work. Practice this and the other depression self help tools in this website and you will be well on your way to end depression.